... Dr. Vo becomes the ONLY VIETNAMESE doctor in the world who has qualified for this extremely selective program and one of the few apprentices to Dr. John Beumer III, the worldknown father of Maxillofacial Prosthetics field. Growing in a family whose mother is a caring dentist, and father is a dedicated professor at University of Technology in Saigon before 1975, Dr. Dinh Vo inherited both the enthusiasm for inventing beautiful smiles and the passion for teaching. To his classmate, Dinh was known as a golf lover, and a compassionate friend who is willing to help out with lab work till late yet can play 3 rounds of golf on one summer day next day. To his professors, Dinh is a hardworking student who is thrived to achieve perfection in his work. It was also his professor who has recommended him to go for Prosthodontics degree. 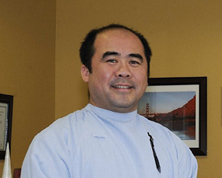 Even though Dinh qualified for other specialties, he has followed the advice and pursued a degree in Prosthodontics. He said ‘Specialists are designed to play important roles in the patient oral care field. In which, Prosthodontics is the quarterback of dentistry. Prosth is the coordinator, working along side with other specialists to derive at the best plan of action, resulting in the best outcome for the patients. Too bad I didn’t qualify to become a quarterback for the Trojan footbal team, be a Prosthodontics then’ and he laughed. Prosthodontics is the dental specialty pertaining to the diagnosis, treatment planning, rehabilitation and maintenance of the oral function, comfort, appearance and health of patients with clinical conditions associated with missing or deficient teeth and/or oral and maxillofacial tissues using biocompatible substitutes (cited from American Dental Asssociation website). In another words, Prosthodontics deals with the most complicated and difficult cases in dental restoration. In 3 years of Prothodontics at University of Southern California, Ostrow School of Dentistry, Dr. Dinh Vo had dedicated his full energy to learn the most, to practice the longest, to work on the most lab cases, and to… He was also a Teaching Assistant who helped 1-4th year students in Clinical Sessions working on patients at USC throughout these 3 years. In his extra time, Dr. Vo also worked at his mother’s office in San Jose. In 2001, University of Los Angeles, California was looking for good candidates for the Maxillofacial Prosthetics program. Maxillofacial Prosthodontists treat patients who have acquired and congenital defects of the head and neck (maxillofacial) region due to cancer, surgery, trauma, and/or birth defects. Maxillary obturators, speech-aid prosthesis (formerly called as Pharyngeal/soft palate obturators) and mandibular-resection prostheses are the most common prostheses planned and fabricated by Maxillofacial Prosthodontists. Other prostheses include artificial eyes, nose and other facial prostheses fabricated. Due to their extensive training in prosthetic reconstruction, breadth of knowledge and capability of handling most types of complex cases, Maxillofacial Prosthodontists have been referred to as “bullet-proof” dentists (cited from American Dental Association website). With an excellent grade achievement, well known and proven hand-skill, and strong letters of recommendation, Dr. Vo becomes the ONLY VIETNAMESE doctor in the world who has qualified for this extremely selective program and one of the few apprentices to Dr. John Beumer III, the world-known father of Maxillofacial Prosthetics field.